Local Photo Experts - Find professional photographers near you. Are you looking for a local professional photographer for portraits, wedding photography, publicity photos, video recording etc? 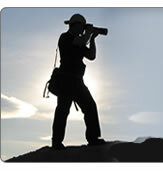 We provide a free, searchable directory of professional photographers in your area. Photographers can register their services for free. If you are looking for a photographer, just use our search box on the right.